The first class of students in the new LRAW program, enjoyed the new format. Practice makes perfect – at least that’s part of the theory behind the ABA’s emphasis on skills training that has law schools across the country taking a closer look at how they prepare their students for the practice of law. 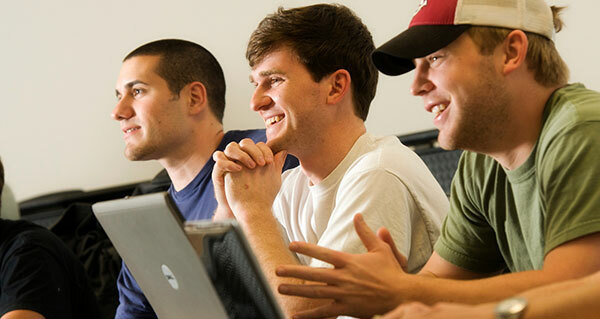 At The University of South Carolina School of Law, we take very seriously our mission of equipping our graduates with the skills they need to become excellent practicing lawyers. In 2011, the Law School unveiled its new Legal Research, Analysis, and Writing Program (LRAW) designed to provide our students with the skills they will need to succeed in law school and in the practice of law. Law students arrive on their first day of law school with the research, writing, and analytical skills they developed in their undergraduate study, work, and life experiences. Many, however, find the study of law more challenging than expected because their former methods of researching, writing, and analysis did not fully prepare them for the rigors of finding, analyzing, and writing about the law. Legal Research, Analysis & Writing (LRAW) is a component of the first year law school curriculum that integrates essential skills necessary for the practice of law. The LRAW program is an intensive six-credit hour program divided over the fall and spring semesters of the first year. In the fall semester (LRAW-1), students learn the basic methods of researching state statutes and case law, how to analyze those statutes and cases, identify and understand legal rules derived from those authorities, and apply those rules to make informed predictions about legal issues. Students also learn how to convey legal analysis clearly and concisely and how to draft a legal prediction in the form of a memorandum of law. In the spring semester (LRAW-2), students build on their basic research, analytical, and writing skills to learn how to research federal statutes and cases, regulations, and secondary sources. Students also learn the skills of persuasive writing and argumentation through the preparation of an appellate brief and oral argument. “I was always told I was a good writer, but it was not until I came to law school that I realized legal writing was different. I have learned that the best legal writing is concise, uses active voice, and is fluid throughout. My writing has become better by incorporating all three into my work. Additionally, my research skills have become better. Because the program now puts an emphasis on the research component, I feel our class really benefited. I was able to employ those skills throughout the summer, and found myself going back to basic research strategies I learned in class that allowed me to find what I needed and saved on costs. My improved writing has also been noticed during my summer clerkship. A partner commented on how impressed he was with my discussion of the information in one memo. I drafted another memo that was good enough to be used in a summary judgment motion. I think it is neat that I am able to write a legal memo in one or two days. I would have never fathomed that before this class.” – Marvin Pendarvis, third-year law student at USC Law. “LRAW definitely helped me in my summer clerkship. My firm only uses Westlaw, but I know how to navigate it well, thanks to the class. I absolutely have used everything I learned, including the Bluebook and citations. I am very confident in how I write now, and the attorneys at my firm used my memos for their court documents.” – Kara Keith, third-year law student at USC Law. “(In the summer of 2011), I worked at Fort Jackson with several fellow Captains who were working as Army prosecutors. I had my first opportunities to draft first a motion and a motion response for two supervisors. Each supervisor was impressed by my work and the skills I had learned this past academic year in 1L LRAW classes. Soon thereafter, I also perceived a shift in their attitudes toward “the intern” as a result of my success using the writing and research skills taught in LRAW, and I began receiving more assignments to draft documents and less supervision in putting those products together before final review.” – Daniel Hancock, third-year law student at USC Law. This story was contributed by Assistant Directors of Legal Writing Jan Baker andAmy Milligan, and Assistant Director of Legal Research Instruction Terrye Conroy. This entry was posted in Colophon on 9 August 2013 by thefineprint.